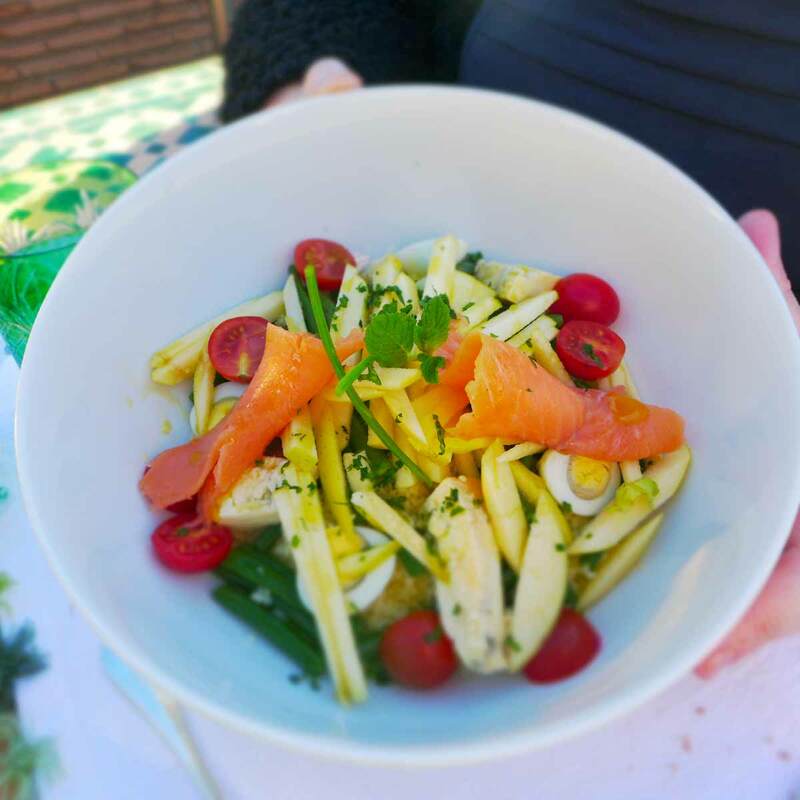 As part of our stay at the impressive La Sultana hotel in Marrakech we ate a relaxed lunch in their al fresco dining area, and the setting for this is fabulous – on the roof of the hotel looking into the historic Saadian tombs next door. Despite being December, the weather was like a summer’s day in Glasgow so we decided to go for light salad dishes but they do sell a couple of tagines and a selection of kebabs and grilled meat and fish. If you are here in summer then you can also have an evening meal on the roof. 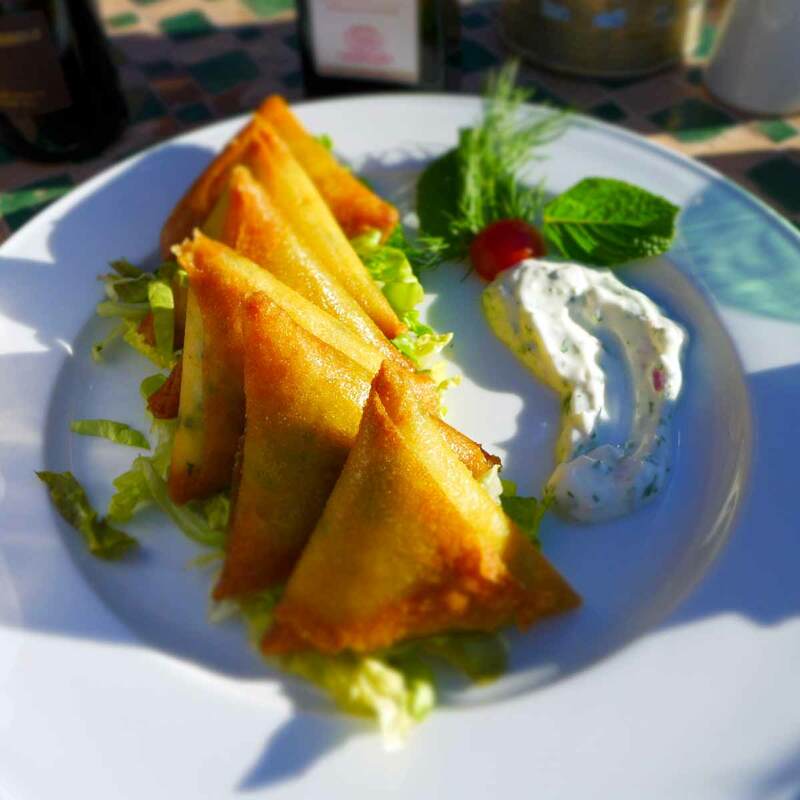 Vegetable & cheese briouates with a minty yogurt sauce, like a cross between an Indian samosa and burek that you would find in the Balkans/Turkey, these were crunchy little morsels filled with creamy cheese and vegetables – 3 of each. Scallop carpaccio with fresh basil – now this was a bit unusual, I don’t think we’d ever come across scallop carpaccio before and being a carpaccio aficionado I had to give it a go. It wasn’t fishy at all but was light and clean tasting, served with delicious fresh tomatoes and rocket (and basil) to providing the main flavours in this dish. Sultana’s choice salad – there was a Caesar salad on the menu, or you had the option to create your own from a selection of ingredients – 2 basics (pasta, lettuce, beans etc) then 4 market ingredients (eggs, tomatoes, walnuts etc) and 1 Sultana’s choice (various meats and seafoods) with a choice of vinaigrettes. 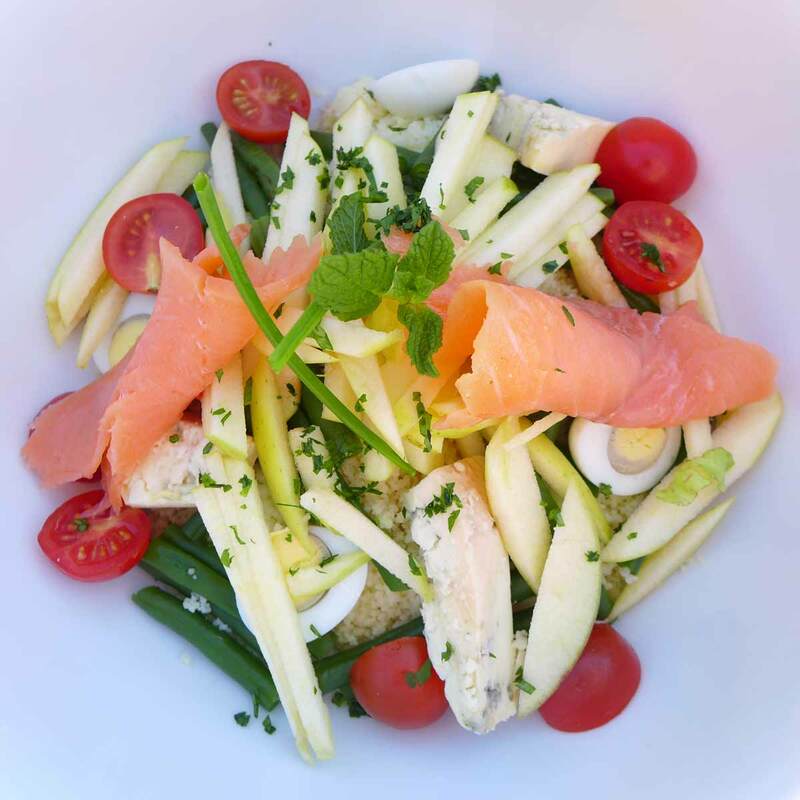 We opted for a semolina salad with tomatoes, eggs, apples, and smoked trout from the Atlas mountains and everything was fresh and delicious! We had a wonderful lunch, the ingredients were fresh and the sunshine most welcome! Service was not obtrusive, which was what we wanted so we could take our time and enjoy the sun! Staff were very attentive and spoke excellent English. Toilets clean and well-maintained. Read about our stay at the hotel here, our hamam (traditional spa) experience here and our cookery class here. 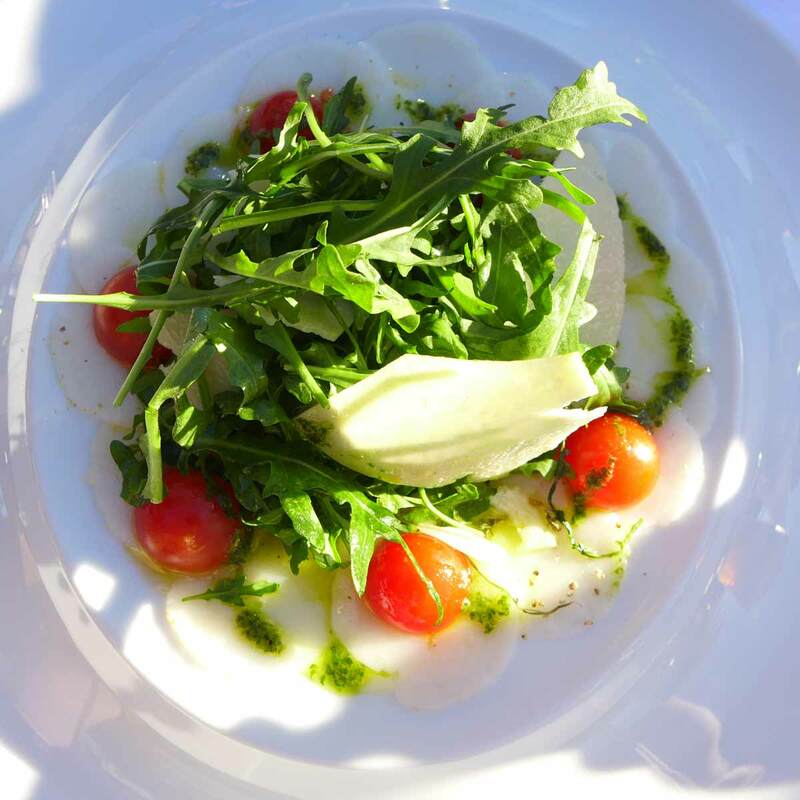 Non-residents can also dine at La Sultana but you are advised to make a reservation – to book a room, lunch or dinner please visit their website. Our accommodation cost was covered by La Sultana Hotel. The lunch was paid for by ourselves.